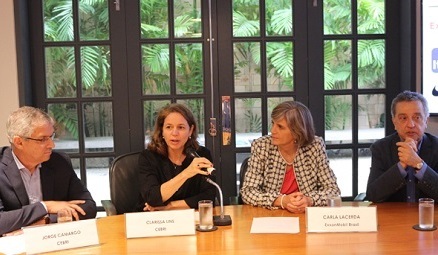 Considered one of the main Brazilian think tanks according to the annual ranking held by the University of Pennsylvania, CEBRI – Brazilian Center for International Relations, invited Clarissa to implement its energy center under Jorge Camargo’s leadership, a member of the entity’s Board of Trustees . The energy center’s goal is to promote debates on issues related to energy and oil and gas that (i) have the potential to leverage the Brazilian industry insertion in global chains; (ii) are aligned with global energy trends (technological innovations, regulation, geopolitics, management, etc. ); and (iii) have the potential to influence the formulation of public policies in the creation of a competitive and attractive investment environment. In this context, the center promotes meetings held under Chatham House rules (without disclosure of the content discussed), in order to stimulate the dialogue between different actors and engage opinion leaders. Clarissa Lins’s role lies as events’ idealizer and debates’s moderator. 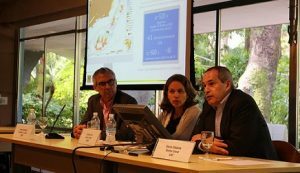 The first debate, held in August 2017, was attended by Carla Lacerda, president of ExxonMobil in Brazil, and Jorge Camargo, member of CEBRI’S Board of Trustees and president of IBP – Brazilian Institute of Petroleum, Gas and Biofuels. The discussions focused on the oil and gas industry challenges in Brazil, in the current changes context, as well as the global environment. The second meeting, held in partnership with “Casa das Garças” in September 2017, aimed to deepen the comprehension about the ongoing changes in the Brazilian oil and gas institutional / regulatory environment. Jorge Camargo, IBP’s president, and Décio Oddone general director of ANP – Agência Nacional de Petróleo, were invited to do so. The third debate, held in November 2017, focused on the electricity and oil and gas sectors recent approximation, with an emphasis on the role to be played by natural gas in the Brazilian power matix. The speakers list included Elena Landau, economist, lawyer and former chairman of Eletrobrás Board of Directors, Adriano Pires, founder and CEO of the Brazilian Center for Infrastructure, and Rodrigo Costa Lima, Petrobras natural gas executive manager.